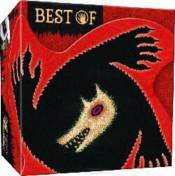 New in the Werewolves of Miller�s Hollow line comes Best of Werewolves of Miller�s Hollow! To celebrate the original game and its howling legacy, the original designers decided to take all their favorite character combinations and bring them to you. With characters taken from all the expansions�New Moon, Characters, The Pact�and put in one box, now it�s easier than ever to put together a terrifying game of Werewolves of Miller�s Hollow. Play the way the designers do with Best of Werewolves of Miller�s Hollow.